Love good burgers? 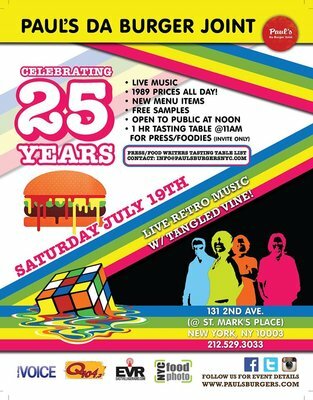 Come celebrate the 25th anniversary of Paul’s “Da Burger Joint”, an East Village institution. Paul’s kicking-off an updated menu with live entertainment, FREE samples, and a bonus– Roll-back pricing to 1989, just for this momentous occasion! Location: Remember that place in East Village with the ginormous hamburger outside? Yes, the one people keep taking pictures with, drunk or not. It’s on 2nd Ave, near the corner of St. Mark’s Place and 2nd Ave.
Open back in 1989 by Paul (then called “Paul’s Palace”), it provides burgers at honest prices. Fast-forward to 2014, Paul’s Da Burger holds the same core values. A burger can be had for as little as $5.50 up to $11, complemented by entrees and a breakfast menu. It’s still largely a 50’s style diner with checkered table cloths and vintage decor, but that hasn’t stopped locals, regulars, tourists, and drunken revelers (you know who are) from enjoying a good burger and beer. The Gothamist just listed it in the “Top 14 Best Burgers in NYC” and on Burger Weekly’s Top 50. Tags: burgers, food tasting. Bookmark the permalink.